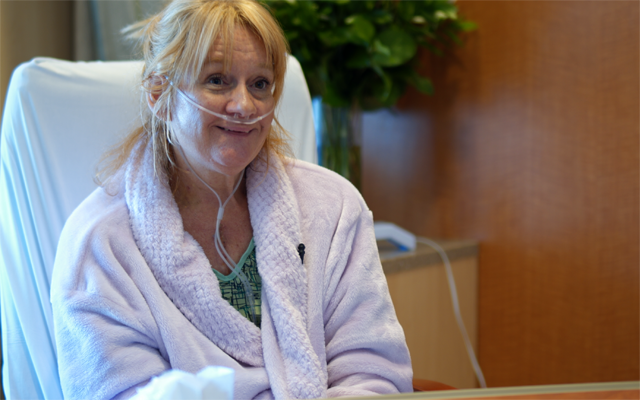 Shelia Holt – UC San Diego Health’s 4,000th PTE patient. When Shelia Holt found herself breathless from everyday activities, like walking a flight of stairs, she knew it was a red flag. “I was not able to do the things I love to do — riding a bike, hiking or even walking for long periods of time.” Holt was diagnosed with chronic thromboembolic pulmonary hypertension (CTEPH). The condition can develop in people who have chronic blood clots in their lungs, which Holt had. During the eight-to-ten hour surgery, the patient is put into a kind of suspended animation in which heart function and blood circulation are stopped and the brain ceases activity while surgeons clear the pulmonary arteries of disease. Holt was the 4,000th patient to undergo the procedure at UC San Diego Health. The surgery is a feat for the patient and the surgeon. In order for the clots to be removed, the surgeon must be able to see clearly into the lung’s tiny arteries. This requires operating without any blood present. To achieve this environment, the patient’s body is cooled and the blood is almost completely drained while the patient is on a heart-lung machine. The bypass machine is then stopped for periods of about 20 minutes at a time while the surgeon races against the clock to remove the blockages. During this time, both heart and brain wave monitors are flat lined. UC San Diego Health performs its 4,000th PTE surgery. Using sophisticated techniques and special long, slender instruments, the surgeon rapidly dissects out the chronic clots without perforating the paper-thin artery wall. The clots look like white scar tissue, which when arranged on a surgical table, take the shape of the intricate inner branches of the lung’s arteries. “Refining our imaging, instruments and operative strategy allows us to go farther into the vessels to remove the scar tissue. Just five or ten years ago, Shelia may not have been a candidate for surgery due to where her clots were located,” said Madani. Madani and the surgical team are now using a minimally invasive approach for qualifying patients. Two inch incisions are made on each side of the chest area instead of a larger opening of the sternum. “In some cases, we can perform the procedure with only one incision,” said Madani. UC San Diego Health has performed more PTE procedures than any other institution in the world. For the past decade, the program has reported a mortality rate of approximately 1 to 2 percent — the lowest known postoperative mortality rate worldwide. The procedure can reverse right heart failure and is considered the most effective way to treat CTEPH. CTEPH is often misdiagnosed or unrecognized because the primary symptom — shortness of breath — is non-specific. “On average, these patients can go two years before a correct diagnosis is made,” said Kim. Patients are often incorrectly treated for asthma or COPD. It has been reported that as high as 3.8 percent of individuals with first-time pulmonary embolism may develop CTEPH. This suggests there may be thousands of new cases of CTEPH in the United States annually. Improving awareness of CTEPH may lead to more patients being cured of this life threatening condition. “Every day since my surgery, I am feeling better and stronger. It’s amazing that I can take a deep breath and that there was improvement so quickly. I was walking laps around the hospital the next day,” said Holt. The PTE program was established in 1970 at UC San Diego School of Medicine by Kenneth Moser, MD, pulmonologist, who pioneered the diagnosis and treatment of CTEPH, and Nina Starr Braunwald, MD, who was among the first female surgeons to perform open heart surgery. Over the next two decades, many surgeons and physicians contributed to the success of the program, however, it was the arrival of Stuart Jamieson, MB, FRCS, in 1989 and his collaboration with his medical counterparts that helped advance the field and UC San Diego’s reputation globally in the treatment of this debilitating condition. Scar-like tissue removed from patient’s pulmonary arteries. The UC San Diego PTE program is the first program to be nationally designated as a Center of Excellence by the American College of Chest Physicians. The program represents the remarkable efforts of a team of physicians, surgeons, anesthesiologists, nurses, respiratory therapists and social workers who combine their expertise and passion into a world-class program. “The transformation that we see first-hand is amazing. These are some of the sickest patients with end-stage heart failure from pulmonary hypertension. Within two weeks they become almost a new person,” said Kim. “Throughout the year, our team receives emails, letters, holiday cards and other messages from patients who celebrate the anniversary of their surgery and express their deep gratitude,” said Kim.